This brings in Enzyme and sets up the adapter for running our tests. To make things easier on us, we are going to write tests for a React application I have already built. Grab a copy of the app over on GitHub. Snapshot testing is used to keep track of changes in the app UI. If you’re wonder whether we’re dealing with literal images of the UI, the answer is no, but snapshots are super useful because they capture the code of a component at a moment in time so we can compare the component in one state versus any other possible states it might take. The first time a test runs, a snapshot of the component code is composed and saved in a new __snapshots__ folder in the src directory. On test runs, the current UI is compared to the existing. Here’s a snapshot of a successful test of the sample project’s App component. 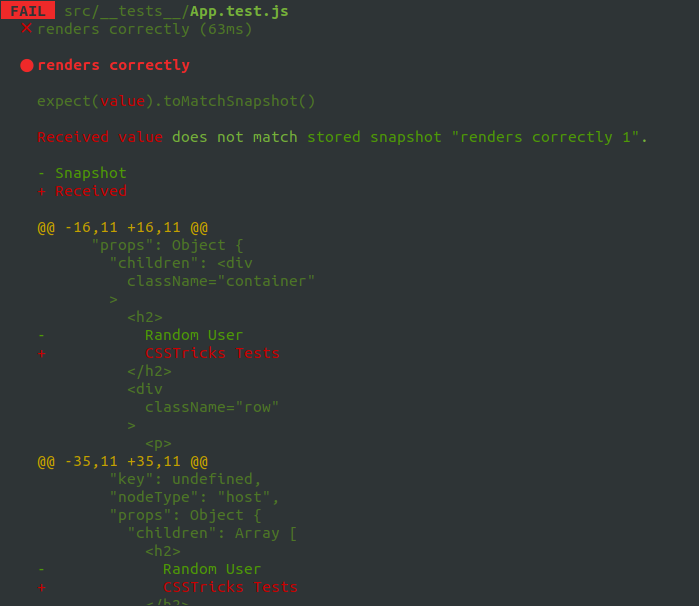 Every new snapshot that gets generated when the test suite runs will be saved in the __tests__ folder. What’s great about that Jest will check to see if the component matches is then on subsequent times when we run the test, Jest will check to see if the component matches the snapshot on subsequent tests. Here’s how that files looks. Inspect your code changes or press `u` to update them. So, that’s what we’ll do in this case. We press u to update the snapshot, the test passes, and we move on. Did you catch the shallow method in our test snapshot? That’s from the Enzyme package and instructs the test to run a single component and nothing else — not even any child components that might be inside it. It’s a nice clean way to isolate code and get better information when debugging and is especially great for simple, non-interactive components. In addition to shallow, we also have render for snapshot testing. What’s the difference, you ask? While shallow excludes child components when testing a component, render includes them while rendering to static HTML. There is one more method in the mix to be aware of: mount. This is the most engaging type of test in the bunch because it fully renders components (like shallow and render) and their children (like render) but puts them in the DOM, which means it can fully test any component that interacts with the DOM API as well as any props that are passed to and from it. It’s a comprehensive test for interactivity. It’s also worth noting that, since it does a full mount, we’ll want to make a call to .unmount on the component after the test runs so it doesn’t conflict with other tests. Lifecycle methods are hooks provided by React, which get called at different stages of a component's lifespan. These methods come in handy when handling things like API calls. Since they are often used in React components, you can have your test suite cover them to ensure all things work as expected. We do the fetching of data from the API when the component mounts. We can check if the lifecycle method gets called by making use of jest, which makes it possible for us to mock lifecycle methods used in React applications. We attach spy to the component’s prototype, and the spy on the componentDidMount() lifecycle method of the component. Next, we assert that the lifecycle method is called once by checking for the call length. How can you be sure that props from one component are being passed to another? We have a test confirm it, of course! The Enzyme API allows us to create a “mock” function so tests can simulate props being passed between components. Let’s say we are passing user props from the main App component into a Profile component. In other words, we want the App to inform the Profile with details about user information to render a profile for that user. Mock functions look a lot like other tests in that they’re wrapped around the components. However, we’re using an additional describe layer that takes the component being tested, then allows us to proceed by telling the test the expected props and values that we expect to be passed. This particular example contains two tests. In the first test, we pass the user props to the mounted Profile component. Then, we check to see if we can find a <h4> element that corresponds to what we have in the Profile component. In the second test, we want to check if the props we passed to the mounted component equals the mock props we created above. Note that even though we are destructing the props in the Profile component, it does not affect the test. There’s a part in the project we’ve been using where an API call is made to fetch a list of users. And guess what? We can test that API call, too! The slightly tricky thing about testing API calls is that we don’t actually want to hit the API. Some APIs have call limits or even costs for making making calls, so we want to avoid that. Thankfully, we can use Jest to mock axios requests. See this post for a more thorough walkthrough of using axios to make API calls. First, we'll create a new folder called __mock__ in the same directory where our __tests__ folder lives. This is where our mock request files will be created when the tests run. The Jest API has a spyOn() method that takes an accessType? argument that can be used to check whether we are able to “get” data from an API call. We use jest.spyOn() to call the spied method, which we implemented in our __mock__ file, and it can be used with the shallow, render and mount tests we covered earlier. That’s a primer into the world of testing in a React application. Hopefully you now see the value that testing adds to a project and how relatively easy it can be to implement, thanks to the heavy lifting done by the joint powers of Jest and Enzyme. I’m in “Taking snapshots of tests” section, I didn’t find anything about how to actually run the tests. Thanks for pointing that out, you can run the test using yarn run test. I have also added that in the tutorial. One thing I notice a lot of React/Enzyme testing guides suggest is testing whether props are being set on a component. This always seems strange to me because if you set props on a component then there should not be a scenario where those props are not set on that component. Am I missing something?